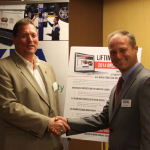 Las Vegas (Nov. 5, 2013) – The Automotive Lift Institute (ALI) has developed an interactive, online vehicle lift safety course based on its popular Lifting It Right DVD hosted by racing legends Richard and Kyle Petty. ALI is partnering with dealer services provider KPA, which has trained more than 1 million automotive industry professionals, to produce and deliver the online program. It will be available in early 2014. Lifting It Right: 2014 Online Edition covers the wide variety of lift types used in professional vehicle service and repair shops, the lifting and lowering process and the importance of planned lift maintenance performed by a qualified professional. A narrator guides the viewer through each section, highlighting safety measures with easy-to-understand instructions and relevant scenarios. The viewer learns which lifts work best for certain jobs, as well as best practices for spotting a vehicle, selecting proper adapters and working under the vehicle. Real-world scenarios with corresponding questions are presented throughout to gauge comprehension. At the conclusion of the program, a certificate of completion is generated and stored online. This certificate can also be printed for display or placed in employee training records. Upon completion, each participant will also receive a copy of ALI’s Automotive Lift Safety Tips card and the Lifting It Right safety manual via mail. The course’s online records management component will significantly simplify the lift operator training process for dealerships, independent repair shop owners, government agencies, vocational schools and other facilities equipped with vehicle lifts. Lifting It Right: 2014 Online Edition will be available for purchase in January atwww.autolift.org. To be notified via email when the program goes live, register atwww.autolift.org/subscribe.php. A preview of Lifting It Right: 2014 Online Edition is available at www.youtube.com/watch?v=RucXwkKux3M&feature=youtu.be. To learn more about ALI, visit www.autolift.org or call (607) 756-7775. You can also connect with ALI on Facebook at www.facebook.com/LiftInstitute, on Twitter atwww.twitter.com/LiftInstitute, and on YouTube at www.youtube.com/LiftInstitute. Founded in 1945, the Automotive Lift Institute (ALI) is a trade association of North American-based lift manufacturers. ALI’s mission is to promote the safe design, construction, installation, service, inspection and use of automotive lifts. In 1947, ALI developed the first Commercial Standard covering vehicle lifts published by the National Bureau of Standards. Today, ALI sponsors several internationally recognized lift safety standards and offers third-party certification programs for automotive lifts and automotive lift inspectors.